CHICAGO – In the latest HollywoodChicago.com Hookup: TV with our unique social giveaway technology, we have 25 pairs of advance-screening TV passes up for grabs for NBC’s new TV pilot “Revolution” from “Iron Man” director Jon Favreau and executive producer J.J. Abrams! NBC’s “Revolution” pilot, which premieres on Sept. 17, 2012 at 9 p.m. CST following “The Voice,” stars JD Pardo, Zak Orth, Billy Burke, Maria Howell, David Lyons, Daniella Alonso, Michael Duisenberg, Giancarlo Esposito and Tim Guinee from director Jon Favreau, executive producer J.J. Abrams (“Star Trek,” “Super 8,” “Cloverfield,” TV’s “Lost,” TV’s “Fringe”) and writer and creator Eric Kripke. To win your TV passes courtesy of HollywoodChicago.com, get interactive with our unique Hookup technology directly below. This screening is on Thursday, Sept. 6, 2012 at 8 p.m. in downtown Chicago. The more social actions you complete, the higher yours odds of winning! What would you do without it all? In this epic adventure from J.J. Abrams’ Bad Robot Productions and Eric Kripke (“Supernatural”), a family struggles to reunite in an American landscape where every single piece of technology – computers, planes, cars, phones and even lights – has mysteriously blacked out forever. A drama with sweeping scope and intimate focus, “Revolution” is also about family – both the family you’re born into and the family you choose. This is a swashbuckling journey of hope and rebirth seen through the eyes of one strong-willed young woman, Charlie Matheson (Tracy Spiridakos, “Being Human”), and her brother, Danny (Graham Rogers, “Memphis Beat”). When Danny is kidnapped by militia leaders for a darker purpose, Charlie must reconnect with her estranged uncle, Miles (Billy Burke, the “Twilight” movies), a former U.S. Marine living a reclusive life. Together, with a rogue band of survivors, they set out to rescue Danny, overthrow the militia and ultimately reestablish the United States of America. All the while, they explore the enduring mystery of why the power failed and if – or how – it will ever return. 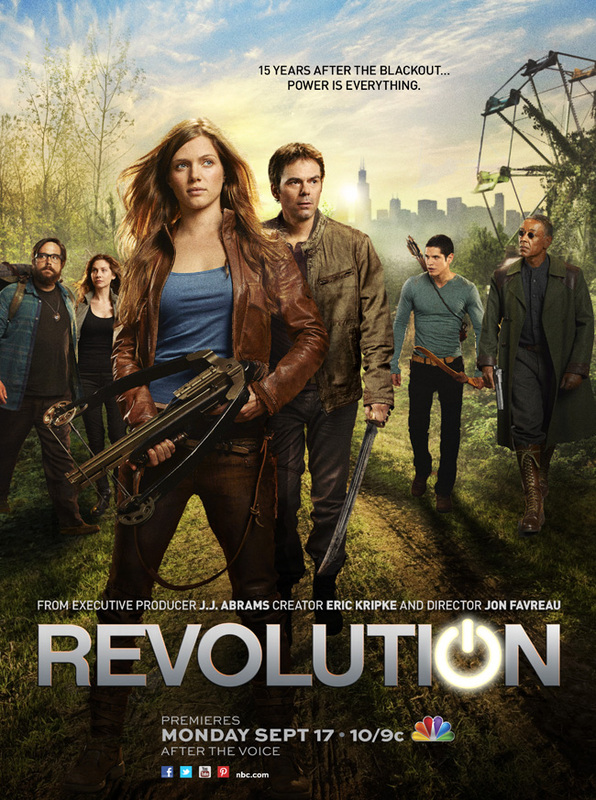 NBC’s “Revolution” pilot premieres on Sept. 17, 2012 at 9 p.m. CST following “The Voice”. The trailer for NBC’s “Revolution” pilot can be watched now below. This HollywoodChicago.com Hookup is simple! Just get interactive in our unique Hookup technology above. We will award 25 pairs of advance-screening TV tickets based on social entry numbers and/or randomly via e-mail for our “Revolution” pilot Hookup. Good luck! Winners need to arrive early as seats are consumed on a first-come, first-served basis. Since advance screenings are overbooked to ensure a full house, winners are not guaranteed entrance and must arrive early. We recommend arriving 45 minutes before the screening’s scheduled start time. Winners are typically e-mailed our advance-screening passes two days before the screening date. HollywoodChicago.com LLC is a promotional partner with the studio and its partners and doesn’t assume any liability for this giveaway. Note: Comments are closed in this Hookup.